This Rapid Lightening Regimen has a full 90-day supply to treat skin discoloration from the 4 major causes of hyperpigmentation: sun, genetics, hormones, and inflammation. 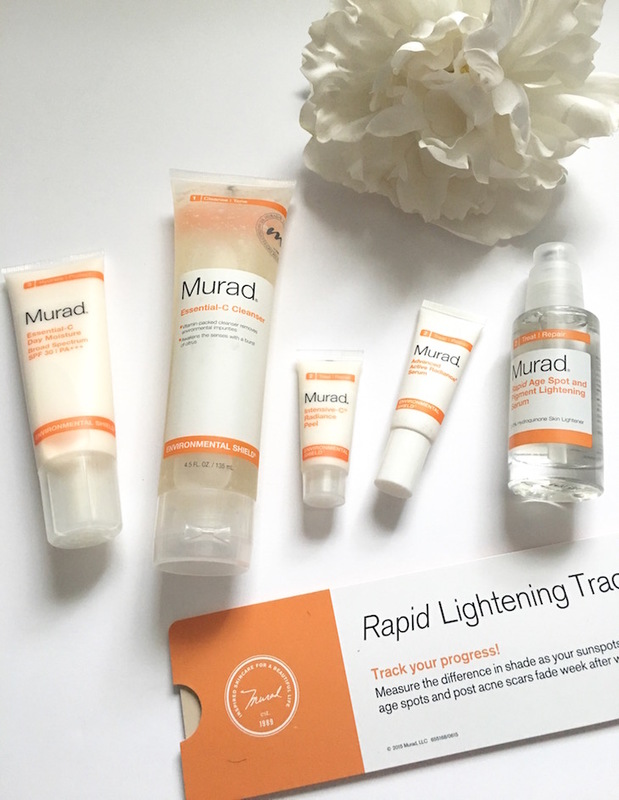 Each product in the 90-Day Rapid Lightening Regimen treats hyperpigmentation at the source so you can start seeing brighter-looking, more even skin tone in as little as 7 days. The Vitamin-C rich Essential-C Cleanser removes skin-dulling impurities to renew skin’s radiance. The Rapid Age Spot and Pigment Lightening Serum contains 2% Hydroquinone which lightens dark spots and skin discoloration. Our Essential-C Day Moisture Broad Spectrum SPF 30 | PA+++, rich in Vitamin-C and antioxidants, revitalizes and protects your skin from further damage. "Patented antioxidant-rich cleanser using Vitamins A, C and E neutralize and rehydrate environmentally damaged skin by removing impurities and awakening the senses with a burst of citrus." "Fast-acting treatment featuring Hydroquinone fades dark spots, age spots, and freckles. Our skin-lightening serum also evens out skin tone to reveal a clearer, brighter complexion while helping prevent future pigment formation. "This is a powerful, antioxidant-rich daily moisturizer that shields and revitalizes environmentally stressed skin. It’s made to protect your skin from UVA/UVB rays and free-radical damage, while improving skin’s radiance, firmness, and elasticity. • Preserve hydration all day"
"Brighten, smooth and hydrate to see a radiant glow after just one treatment. Glycolic Acid exfoliates to accelerate turnover of dark damaged cells, removing dullness and improving skin texture. Myrtle Extract supports cellular renewal to boost youthful resilience and elasticity. Vitamin C and Indian Fig protect against free radical damage while enhancing skin clarity and luminosity." "Fast-acting treatment featuring Resilient-C Complex rapidly boosts radiance and reverses visible signs of environmental damage. This powerful serum helps to improve brightness, clarity and radiance. Brighter and more radiant in 1 week based on a Murad sponsored study." -Helps prevent environmental damage (Specially great for preventing sun spots during summer time). These products are totally amazing and I definitely recommend them.